ReBearth Products, Inc. is a wholesale distributor of drilling supply, geothermal and energy-efficient products. We are a family-owned business which has been supplying the Environmental, Geothermal, and Horizontal-Vertical drilling markets for over 20 years from the same location. 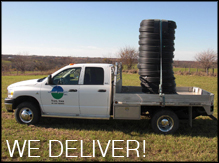 We originally opened as an environmental consulting company with a small supply division in 1989. Initially, this division sold drilling materials for the installation of ground water monitoring wells including PVC pipe and protectors, silica sand, and bentonite products. As the consulting company expanded into additional environmental markets, the supply division also pursued other outlets for its growing line of environmental and drilling products and accessories. By January 1995 established market presence justified setting up the supply division as the separate company, ReBearth Products, Inc. Since then ReBearth sales have grown to include, among others, products for the road and bridge construction industry, lagoon soil sealant and lining applications, a line of horizontal directional drilling tooling, and most recently, what we consider to be top-of-the-line energy saving, environmentally friendly heating & cooling units and construction products. These include high performance insulation products, radiant hydronic heating systems, geothermal furnaces, and high velocity air handling systems. We continue to look for additions to our line that will not only enhance our current offerings but most importantly, help anyone lessen their energy consumption and dependence on fossil fuels. We feel strongly that today's energy picture worldwide is opening a market of grand proportion for alternative methods and, finally, a market of true longevity. Coupled with our belief that change has to be accomplished is our long term commitment to help drive that change.